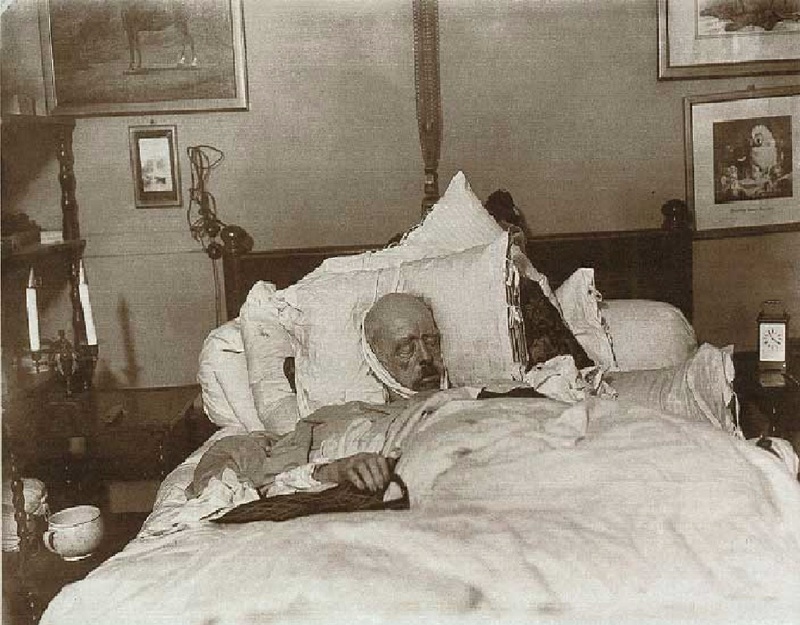 The shocking image of the dead German Chancellor, Otto von Bismarck (1815–1898), lying dishevelled, propped-up on his deathbed may be the world’s first ‘paparazzi’ photograph. The clandestine photograph was taken by two young photographers, Max Priester and Willy Wicke on 30 July 1898. They broke into Bismarck’s chambers by bribing a servant and photographed his corpse only a few hours after his death: in fact, the deceased Chancellor’s family had only just paid its last respects and left the bedroom when the photograph was taken. This grainy black and white photo of Bismarck’s corpse turned out to be the final image of the great leader – no ‘official’ death mask or post-mortem portrait were made. Bismarck’s emaciated face peers out from above a sea of bed covers and pillows, exposed in the cruel, bright ray of magnesium light used by the photographers to illuminate the scene. Save for a protruding right hand, Bismarck’s collapsing body lies invisible beneath the bed sheets. In this iconoclastic image, Bismarck – the national hero who unified Germany – is revealed in a frail and un-heroic state: a chamber pot at his bedside, he slips from the world, much as his body slides underneath the sheets. Priester and Wicke’s behaviour caused public outrage in Germany. It led to the confiscation of their plates by the police and to civil and criminal legal proceedings being brought against them in 1899. In the end, Priester was sentenced to five months in prison and Wicke received eight months. Their censored plate was handed over to Bismarck’s family where it remained invisible for a long time, though remarkably, it was not destroyed. Instead, it was to resurface after World War II, to circulate in a context where such images did not seem so shocking in the wake of the War’s atrocities. Today, the image can be found readily available on the internet. The image of the dead Bismarck marks one of the first encounters between the Law and photography. At the heart of this encounter, we find what might be described as three categories of image ‘offence’, all of which are conflated in the taking, content and (attempted) distribution of this disturbing photograph. The first offence is the manner in which the photograph is ‘taken’ – seen here in the duplicitous intrusion by the photographers into the ‘sacred’ realm of Bismarck’s home. The second offence is the ‘content’ of the photograph – the intimate and undignified image of the dead Bismarck – a sight which was only supposed to be visible to Bismarck’s family members (even Kaiser Wilhelm II was denied access by Bismarck’s family to view his dead body). The third offence is the ‘distribution’ of the photograph – the way in which the photographers sought to exploit it by selling or licensing it for profit, thereby transforming the dead Bismarck into a commodity. The Law has grappled with these three image offences (often instigated by paparazzi and the media) in different manifestations throughout the 20th/21st centuries. This has led to the construction of a law of privacy rights driven largely by image disputes. In some instances, the Law has focused on specific image offences to the exclusion of others. In 2004, for example, Princess Caroline of Monaco was able to persuade the European Court of Human Rights that the media’s publication of largely anodyne photographs of her in ‘public’ places infringed her “reasonable expectation” of privacy. At stake were image offences based on the taking and distribution of the photographs rather than on their specific content. It is, perhaps, no accident that the scandal caused through the explosive elision of all three image offences in Priester’s and Wicke’s photograph would directly lead to the passage of one of the first laws of image rights: section 22 of the German Copyright Act (1907), though the French courts had granted image rights over photographs earlier in the 19th century. In this law, German legislators troubled by the wound caused by the scandal, devised a way to grant subjects ‘rights’ over their image to protect their personality. From now on permission of the subject portrayed would be required when photographs of them were taken and disseminated – though an exemption was granted for public persons or ‘figures of contemporary history’ who would have lesser protection. These rights could persist even after their death and be exercised posthumously by their family relatives. By contrast, when Priester and Wicke had been prosecuted no such rights existed and Bismarck’s relatives/the German state had to rely artificially upon trespass to the Bismarcks’ property. The Bismarck case reveals the Law’s preoccupation with the fate of the photograph, and its intervention to regulate its circulation and visibility. At the same time, it also reveals the need for the Law to move backwards to find a ‘subject’ to ascribe rights to over the photograph in order to control its fate. This subject may lie within the photograph (the privacy rights of the subject in the photograph), behind the photograph (the right of the creator of the image, for example copyright or freedom of expression) or in front of the photograph (the rights of the audience or society not to be offended as reflected in obscenity laws). Whatever the context, the construction of a legal subject in relation to the photograph is contingent and unstable: often the Law has to decide in favour of the rights of one subject (e.g. the depicted) against those of another (e.g. the photographer). Yet what does it mean for a person in a photograph to ‘own’ its image? The law of image rights rests upon two assumptions: the first is that the appearance of the subject can become its property; the second is that a person’s property in its image can be appropriated through (un-authorised) photographic reproduction. Both assumptions are problematic. As the Marxist theorist, Bernard Edelman observes, the notion of a person ‘owning’ its appearance relies upon that person being seen paradoxically by the Law as the ‘author’ of its appearance: in this way the body (nature) is transformed into ‘likeness’ an attribute of personality (culture). It is, perhaps, for this reason that German lawyers first classified image rights within the law to protect authors; the German Copyright Act. At the same time the Bismarck scandal reveals that the origin of the law of image rights is not founded upon the image of a living subject, but instead upon the image of a corpse! That the law of image rights should be founded upon the site of death would seem again deeply paradoxical. How can a dead person protect its likeness? On what basis can personal image rights be exercised by others? The rationale often provided for the post-mortem exercise of image rights is that the dignity of the deceased must be protected in order to avoid suffering to their living relatives – as exemplified in the harm caused to Bismarck’s family. But this only tells part of the story. This paradox only makes sense when the law of image rights is considered contextually in relation to widely held social and cultural taboos concerning photography’s mimetic capacities and its ability, in particular, to appropriate the souls of the deceased. Taboos concerning the photographic representation of the dead co-existed alongside common 19th century practices of photographing the ‘dignified’ dead, particularly images of dead children. When the deceased were photographed (without dignity) these taboos often came to the fore. Just as in Germany, the law of image rights would be founded much earlier in France (1858) in another case involving the photographic representation of the dead; in this instance, the image of a famous actress portrayed on her deathbed (the so-called Rachel case). In this case, without identifying the legal foundation of the right, the French civil court held that the “right to oppose this reproduction is absolute; it flows from the respect the family’s pain commands”. Yet it is difficult not to infer that taboos relating to death and its photographic image were also at work here. Roland Barthes famously observed that death is the eidos of photography – all photographs are indexical traces of lost time or dead moments. Yet this is only part of the picture: defined by reproduction and distribution, photography looks forwards as well as backwards in time. The Law mirrors photography’s ‘double bind’: looking backwards to find a subject in order to control the photograph’s fate, the Law finds a subject, but a subject that is a corpse. Daniel McClean is a lawyer, writer and independent curator. He is head of art and cultural property law at Howard Kennedy FSI (London). He is the co-curator of The Corrupt Show and the Speculative Machine by Superflex, currently on show at the Museo Jumex in Mexico City. Posted on January 13, 2014 December 8, 2016 by vsmallfires	This entry was tagged deathbed, eidos, image rights, Max Priester, Otto Von Bismarck, paparazzi, Roland Barthes, the Law. Bookmark the permalink.